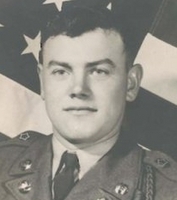 KPOWS: What Happened to America's POWs from the Korean War? What Happened to Sam Logan? Know a Missing Lithuanian-American Aviator? POW Film: Who Are They? Who Is The Tearful POW? "AMERICA’S MISSING KOREAN WAR VETERANS COULD BE IN RUSSIA, FAMILY SAYS"
Excellent piece by Tom O'Connor on the fate of Harry Moore and others believed shipped to USSR during the Korean War. One correx: Film that the legendary Bill Sowles reported might be of his father did not come from classified files, and the ID was from Bill. See here for captured film of Korean War POWs whom Pentagon (to our knowledge) has never identified. 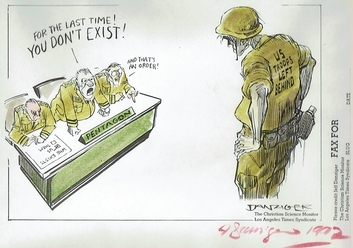 “After 12 years of litigation, and a rebuke from federal court judge Royce Lamberth, the CIA still withholds hundreds of records concerning American POWs who -- in my opinion, the opinion of my client, and in the opinion of a number of senior US officials at the time – were held back by Hanoi and its allies at the end of the Vietnam War.” John H. Clarke, Attorney for Accuracy in Media, Inc., which is funding the suit. The plaintiffs are seeking a summary judgement during 2017. 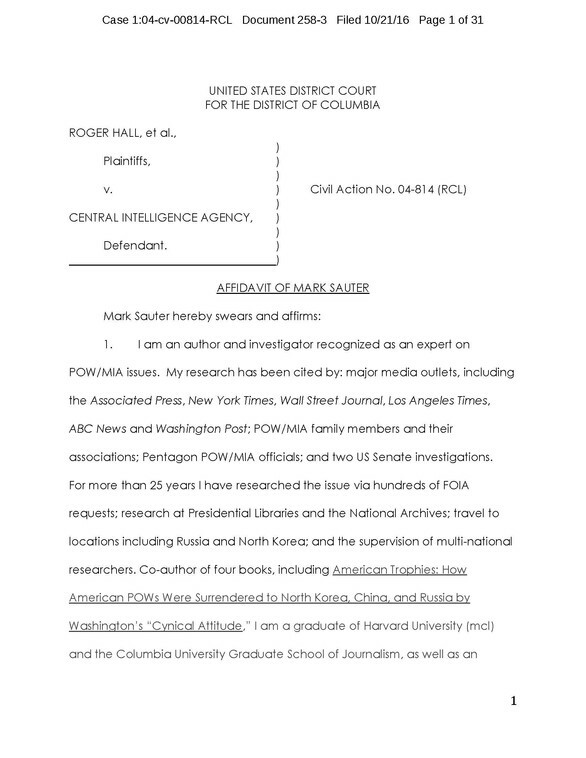 Check out the reaction of the federal judge, a Vietnam veteran, to the CIA's behavior here. "The Families Have Waited Long Enough!" (Memorial Day Weekend, 2016) The families of US aviators lost during spy flights near the Soviet Union, China and North Korea have fought for 60 years to learn the fate of their loved ones -- some captured alive according to intelligence reports. Now time is running out for the aging wives and sisters of the missing and they’ve grown tired of what they call indifference, stone-walling and secrecy from the U.S. government. Read the report, see the declassified documents and review the Pentagon statement here. A Lithuanian-American POW Named "Joe" in an Infamous Soviet Prison? 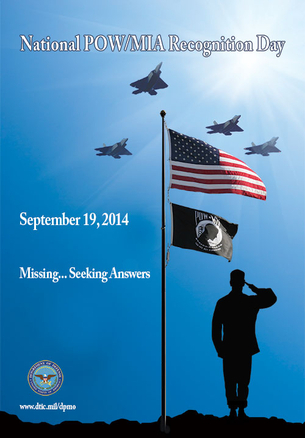 Aside from its new poster to mark the day (see below: "missing...seeking answers"), the Defense POW/Missing Personnel Office (DPMO) has issued a new fact sheet on its efforts to recover US POW/MIAs from North Korea and the Korean War, just in time for this year's POW/MIA Day. 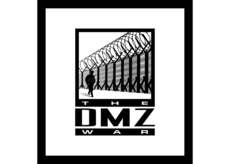 Not mentioned by DPMO is that it and other government agencies are still keeping secret many of the answers it has managed to gather on US servicemen held in North Korea, China and the Soviet Union after the Korean War, and other Americans reportedly imprisoned by North Korea during the Vietnam conflict (where North Koreans fought on the North Vietnamese side) and possibly the Cold War. The government is withholding both decades-old files on Korean War POWs and other more recent ones whose dates are classified. 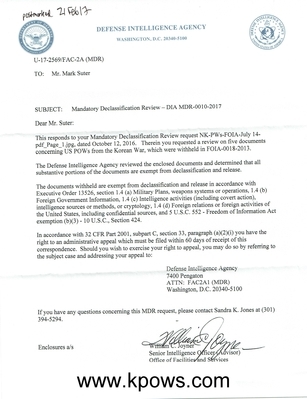 The latest example is the refusal of the Defense Intelligence Agency (DIA) to release five documents on US POWs from the Korean War seen alive after in North Korea, China and/or the former Soviet Union. 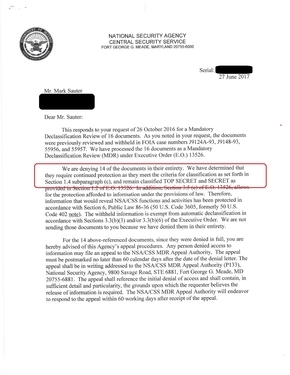 You can see the letter DIA sent us above, which asserts the documents are still classified and also cannot be released for other reasons. As you can see on this site, Pentagon files show that many Americans held by the communists were not returned after the Korean War, included some identified by name and confirmed alive at the end of the war. See these cases. In the years after the war, US POWs were reported in captivity in North Korea and the Soviet Union (others were reported held in secret Chinese camps from which none returned). 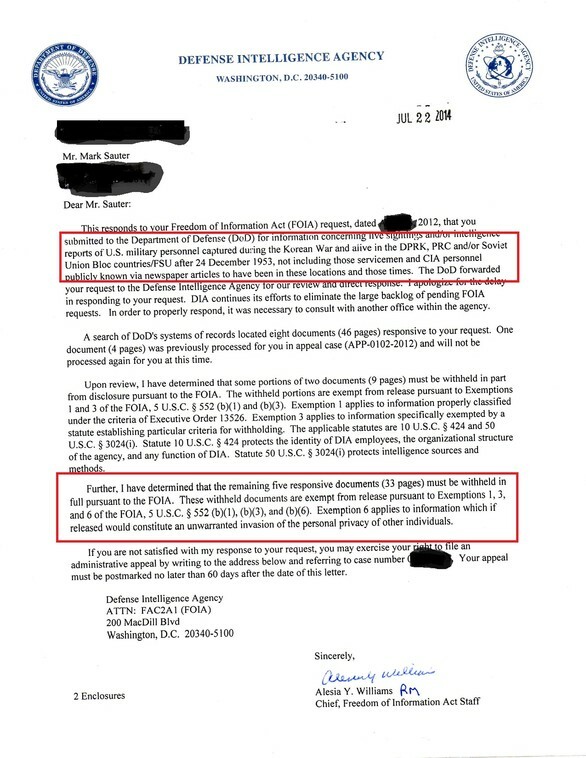 Some documents we've forced out of the government even mention specific buildings where American POWs were reported as late as the 1990s -- the Pentagon apparently did not find this information "useful," since there is no record of a substantial effort to determine the potential veracity of those reports. For more on reports of US POWs alive in North Korea, check out this report by a Pentagon analyst (at bottom of the page) and much more in this book. Meantime, large numbers of documents that Korean War POW/MIA families believe can resolve the fates of some of their loved ones (the types of files that have helped resolve cases in the past) remain classified by the military and National Archives -- including many documents over 50-years-old. See more on that here and in the book. The bottom line: For those "seeking answers" on the fate of America's lost heroes from the Korean War, some answers remain "missing" not in hostile foreign lands, but the files of our own government. this effort has produced no useful information concerning live Americans. Hollywood Movies on America's Korean War POWs, here. Good news: the United Nations Human Rights report on North Korea released on Feb. 17th confirms Pyongyang held back POWs it was supposed to release at the end of the Korean War in 1953. The report offers chilling evidence on the fate of unrepatriated South Korean (Republic of Korea/ROK) POWs and their families. It also raises the issue of ROK POWs captured during the Vietnam War and sent from Vietnam to North Korea (there is some evidence the same fate befell some US POWs). Disgracefully, the UN gives short shrift to US and other allied members of the United Nations forces not returned at the end of the war (the US, South Koreans and more than a dozen other allies officially fought under the United Nations during the Korean War). 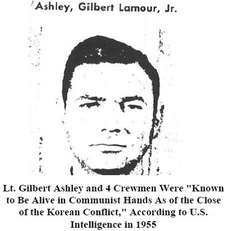 The UN does not mention cases of Americans known alive in North Korean hands at the end of the war, such as the Ashley Five (see their story here), or the numerous reports of American POWs alive in North Korea long after the official end of the conflict. "The Commission heard allegations, relating to the fate of missing soldiers serving under the United Nations Command, particularly soldiers from the United States of America. 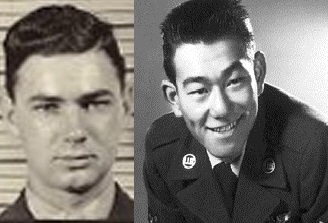 According to the Coalition of Families of Korean and Cold War Prisoners of War and Persons Missing in Action, at the end of the Korean War during the exchanges of prisoners some United States soldiers, who were known to have been alive and in captivity with those who had been released, were not handed over by the DPRK authorities." This section of the report garbles some information provided to it by the Coalition of Families of Korean and Cold War POW/MIAs, leaves out much more data provided to the UN (inc. sightings of alleged US POWs alive in North Korea decades after the war) and includes a non-sequitur wartime quote from the Chinese. The bottom line: The evidence North Korean kept many South Korean POWs is confirmed in the UN report. If the North Koreans kept ROK POWs, why would they not keep Americans? If intelligence reports of ROK POWs surviving long after the war turned out to be accurate, why wouldn't similar reports on Americans also be true? Did China Capture James Deane & Fellow Crewman During Cold War? Lt. (j.g.) James Deane: Kept by China? American Trophies: How US POWs Were Surrendered to North Korea, Russia and China by Washington's "Cynical Attitude"
John Zimmerlee -- expert and son of an aviator missing in Korea -- testified 10/31/13 to the United Nations Commission of Inquiry (COI) on Human Rights in the Democratic People's Republic of Korea. (click here for more on the Commission). John's emotional testimony included points from his prepared remarks (below), but also answers to a number of questions from Commission Chairman Michael Kirby. John asked the UN to press the US National Archives to release thousands of documents involving the POW issue still kept classified. He also remarked that given reports of surviving American prisoners being allowed to marry North Korean women, he might have brothers or sisters in North Korea. John promised to provide additional information requested by the COI and thanked Chairman Kirby and Commissioner Biserko for their interest. 1) I am here to speak for almost 8,000 families across America whose loved ones never returned from North Korea after the Korean War. Many more families around the world are in the same situation: those still missing in North Korea include men from South Korea and many of the 17 nations fighting on the UN side during the war. 2) No other North Korean human rights issue has impacted the United States longer or more widely than the refusal of Pyongyang to resolve the fate of American prisoners reported alive in North Korea and to open its files and warehouse of human remains to account for our dead in that nation. 3) We want to thank the United Nations Commission of Inquiry for its work, especially because all of these missing men were fighting under the United Nations flag when we lost them. United Nations Resolution 906 called for the release of all captive UN troops, this has still not happened. 4) We know for a fact that North Korea held many of our loved ones alive and never returned them. 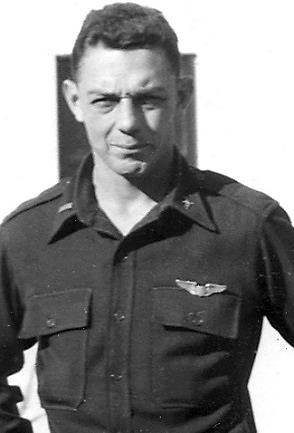 For example, Gilbert Ashley and Hidemaro Ashley, along with three others in their crew, were confirmed alive after the armistice ending the Korean War was signed. United Nations commanders radioed radioed their captors saying North Korea could not deny holding these men and had to return them. That never happened. Their families continue to anguish over their fates. What happened to them? Could they still be alive. 5) This is Sam Logan. Not only did the North Koreans capture him, they allowed his picture to be published around the world. Pyongyang never released him or accounted for him. 6) In thousands of cases, our loved ones simply disappeared without a trace. 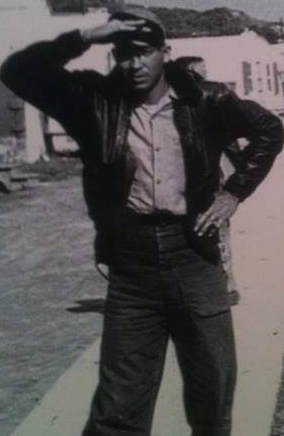 7) This is my father – Capt. 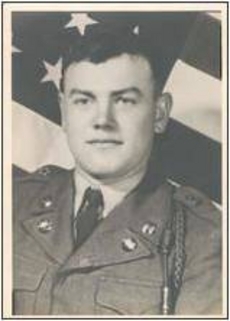 John Henry Zimmerlee, who went missing somewhere in North Korea. 8) Over the years, escaping North Koreans have told us of surviving US POWs (along with British and perhaps other nationals) still alive in North Korea. For example, a former North Korean secret policeman told us he had seen 20 or more surviving US prisoners repeatedly during the 1980s and 1990s. They lived in a special area outside Pyongyang and he even shared a beer with some of them once. There are other credible reports. There is no doubt South Korean POWs are still alive – so why not Americans? North Korea needs to tell us who they are and allow them to see their families again. 9) We understand that many men simply cannot be found after a war. And many of our men died during the conflict as prisoners or on the battlefield. In the case of these men, we simply ask North Korea to follow basic humanitarian principles and share what they know with the families of the missing. Unfortunately, in most cases North Korea has so far refused. For example, we have found the ID cards of missing men displayed as war trophies in a North Korea museum – and North Korea will not account for those men. In addition, it has been proven that North Korea warehouses the remains of Americans lost in the Korean War. We ask North Korea to return those remains and provide the information from its files to help account for our missing. 10) Dear Commissioners: Families across the United States and world ask you to help shed light on the POW issue as part of your inquiry, and to hold North Korea accountable to international human rights laws and norms regarding our loved ones. Thank you very much for your work and the opportunity to speak for the families today. See a bit lower a film not widely seen until recently; we also need your help identifying those US prisoners. Help us! Who is "The Horse" -- USMC POW in Russia or Hoax? Click here for the clues. It reminds us that many South Korean POWs from 1953 are still reported alive in North Korea; some have escaped in recent years. Read about the Soviet soldier here and South Korean POWs here. 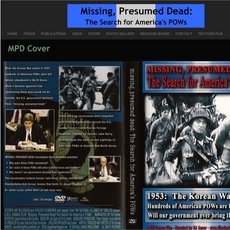 "New" Film of Korean War POWs (US and ROK)? Can You Identify the Prisoners? We recently found this Air Force film. Much of it appears to be from early in the war. Our friends at the National Alliance of Families and Coalition of Families (see lower left of this page), two leading POW/MIA groups, say they've never seen this film. We're also interested in whether DPMO, the Pentagon POW office, has this film and what if anything they've done to investigate it. See the full version below. New: The 1979 Disappearance of PFC Roy Chung -- Is This Newly Released State Department Report About Him? Against American Forces During the War? Don't miss the new Zimmerlee Report -- click here! How Do We Know the Communists Kept American Prisoners After Korea? 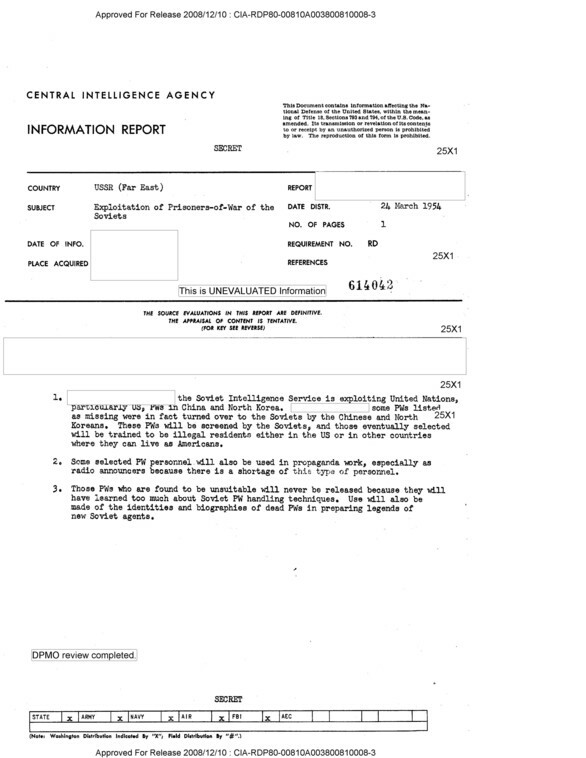 Numerous US intelligence reports during and after the war -- from Soviet officers to refugees -- documented the movement of American POWs out of North Korea to China and the Soviet Union. For example, Army intelligence confirmed and monitored secret prison camps in China -- no Americans returned from them. Hundreds of prisoners held in North Korean camps the communists did acknowlege -- such as Sgt. 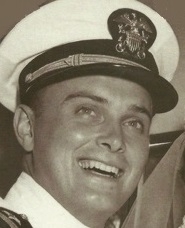 Richard Desautels, above -- were not released at the end of the war. In the years since, information about their survival in Russia, China and North Korea has continued to emerge. "I was in a quandry. The question to me was, 'How do you get these people back without pointing a gun at the communists?' When you have no gun threatening the Reds, there is no way to demand and enforce compliance from them," said General Mark Clark, Commander-in-Chief of UN and US forces, seen here signing the truce that ended the Korean War. In 1954, the U.S. Embassy in Moscow delivered a note to the Soviet government asking it “to arrange their (U.S. POWs taken from Korea to the Soviet Union) repatriation at the earliest possible time.” The Soviets responded by denying they had the prisoners. So Why Isn't the US Government Doing More to Find These Lost Heroes? Today's Pentagon POW/MIA effort focuses mostly on recovering remains of those known killed since WWII, an important task it does well. This involves determining where to look for the remains of missing (almost always those our former enemies claim were killed in battle during the war) and then recovering and identifying them. There is no appetite for a relentless effort to trace those men known to have been kept after Korea. The Pentagon can expect no real help from the Russians, Chinese and North Koreans. And there is no pressure from the White House or Congress. Imagine what the American leaders of 1953, not to mention the prisoners and their families, would think, especially given the cordial relations America has granted Beijing and Moscow, and the very food to keep alive many North Koreans, without ever requiring the truth about our lost heroes. 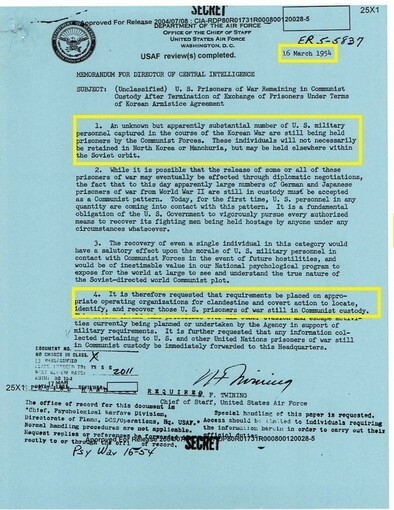 Declassified U.S. government records and other intelligence demonstrate that -- despite decades of official denials from both sides -- the communists secretly held U.S. prisoners during and after the war. Reports continued of their survival in North Korea, China and the Soviet Union following the war. What happened to them? The U.S. government owes these brave men and their families a relentless, high-priority effort to uncover the truth. Take Sgt.Richard Desautels (picture at top). A known POW in a North Korean camp, he feared his Chinese captors would keep him, telling a fellow U.S. prisoner: "(I)f he should disappear to make inquires concerning his whereabouts with the proper military authorities...." When asked by America what happened to him, the Chinese in 1956 claimed he'd "escaped" during the war (they said the same about another GI who was a double amputee). For decades both China and the Pentagon insisted there was no evidence Sgt. Desautels had been secretly shipped to China. Then in 2003, Beijing admitted he'd been taken, but said he'd soon died of "mental illness" and China had lost his body (coincidentally, in a place wartime U.S. intelligence indicated was a trans-shipment point to Siberia.) Beijing even conceded it still had a classified file on the Sgt. But the Pentagon has failed to get that file or the full story about Desautels -- or hundreds of other Americans reported to have suffered similar fates.